The Adobe PDF Print Engine – APPE – is a software platform of ADOBE, specializing in the processing of PDF files and print rendering. It follows the widespread PostScript Level III print language or CPSI (Configurable PostScript Interpreter). Currently, the version 3 of the Adobe PDF Print Engine is available, which was extended by the Mercury RIP architecture. By parallel processing, the engine is able to process on a modern quad-core system four instances of APPE simultaneously on the same PDF file, resulting in a much faster ripping process. In large RIP environments, four computers each with four processor cores can work at the same time on a PDF file. According to Adobe, the APPE RIP is the fastest available technology. 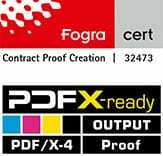 Using PDF / X-4 customer data, we at Proof GmbH observed some absurd long calculation times (3.75 hours for one page with the APPE 2.5 in two parallel instances), which has been referred to by Adobe as “normal” because of the complexity of the file processed. Unlike PostScript Level III the APPE does not support PostScript. A PostScript file must be converted to a PDF file first in order to be processed by the APPE.